After an explosion went off Saturday while Venezuelan President Nicolas Maduro was giving a speech, he accused the opposition of attempting to assassinate him. But confusion still abounds as to what happened, with the Caracas Fire Department and opposition contradicting Maduro and his government’s accusations. Whatever happened, experts say the incident made Maduro look vulnerable, and will probably lead to him concentrating power even further. 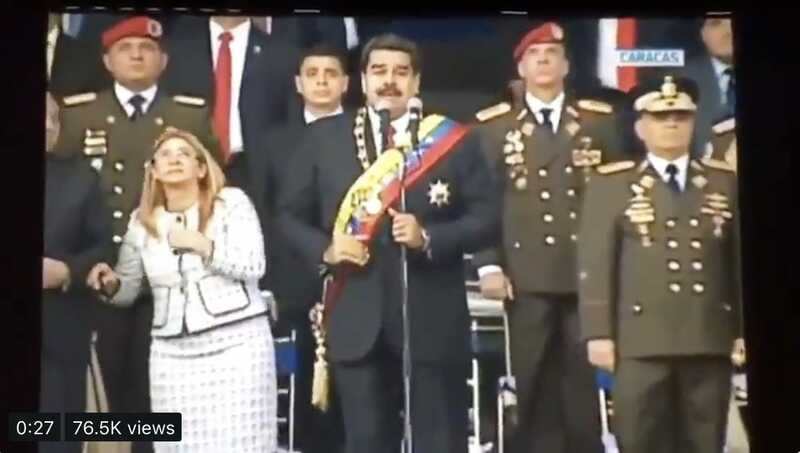 An explosion went off in Caracas while Venezuelan President Nicolas Maduro was giving a speech to hundreds of soldiers during a celebration of the National Guard’s 81st anniversary on Saturday. State television was broadcasting as Maduro spoke when suddenly an explosion was heard. 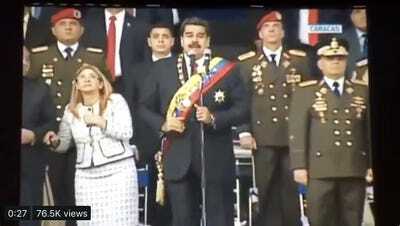 A video showed Maduro’s wife Cilia Flores looking up and wincing and hundreds of soldiers of running in chaos. Maduro was rushed offstage, and is not hurt. Seven people were injured in the incident, according to the AP. The socialist president has since accused the “far-right” opposition party of working with the Colombian government and US citizens in Florida of attempting to assassinate him with a drone attack. The US and Colombian governments have denied any involvement. Seven people have been arrested in connection with the incident, Maduro said. But confusion abounds, with analysts, witnesses and officials appearing to disagree on what actually happened. The Caracas Fire Department said the explosion was from a gas tank in a nearby apartment complex, and Venezuela’s opposition leaders appear to have denied any involvement. San Miguel said the explosion in the apartment complex was something else. Two people who live in an apartment building near where the blast was said to have occurred told the Post that it couldn’t have been an explosion from a gas tank leak. David Smilde, an expert on Venezuela at the Washington Office on Latin America, told the Associated Press that the incident looked like an “amateurish” attack, not a staged one. Further confusing things, a small opposition group called the “National Movement of Soldiers in T-shirts” has claimed responsibility for the attack. Efecto Cocuyo/TwitterVenezuelan President Nicolas Maduro abruptly cut his speech short on August 4, 2018. His wife can be seen on the left, ducking from the loud noise. Analysts agreed that the supposed attack – or whatever it was – made Maduro look vulnerable. “If you wanted an excuse for repression, I think the government would have chosen something that would not make Maduro appear as vulnerable,” Harold A. Trinkunas, deputy director of the Center for International Security and Cooperation at Stanford University, told the Wall Street Journal. Since at least 2014, Venezuela has been mired in turmoil characterised by massive inflation, shortages of food and medicine, and thousands fleeing daily to nearby Colombia and Brazil. Large-scale protests opposing Maduro’s regime were held last year in response to the conditions, which culminated in a former Venezuelan police intelligence officerattacking the Supreme Court with grenades thrown from a helicopter. “A viral video of the first lady and the military top brass looking scared, and images of soldiers running for cover, is just the latest illustration of how exposed the government is to crisis,” Michael McCarthy, a research fellow at American University’s Center for Latin American and Latino Studies,wrote in Axios. “It’s standard practice for their government to use any public disturbance to crack down further,” Farnsworth told the Wall Street Journal. With Maduro facing pressure from both the opposition and within his own party, McCarthy wrote, the incident will likely spark more protests and possibly even more sanctions from the Trump administration.